A fence gate is a great way to increase the security provided by your fence. However, they also come with a problem – power. Manual gates require you to get out of your car or truck to open and close the gate, but automatic gates need a power source. It can be tough – and expensive – to run a power line to your fence, especially on large properties. But there is a solution: solar powered gates. Solar gates offer all the convenience and practicality of a wired electric gate, but with the advantage of being able to be placed virtually anywhere. Learn more about why you should consider solar power for your fence gate. Solar powered gates operate almost exactly like their wired cousins. You can apply a solar power source to virtually any gate, including swing-open and roll-open gates. That means you’re free to choose a gate based on your fence design and your security needs, not based on the power source. Most solar gates are designed to provide 10 watts and 12 volts of power, making them appropriate for light to moderate use in a residential or commercial setting. If you have a heavier gate or need a system appropriate for frequent use, you can also get 20 watt, 24 volt solar systems. Solar gates also include a storage battery that charges off the solar panels so your gate can operate day and night. Gate Location – If you’re building a fence gate far from your main property, it can be tough to run power all the way to your fence. Solar gates can be placed anywhere that gets enough sun and don’t require any additional power. Environmental Friendliness – Solar power is naturally green and environmentally friendly. You also get to avoid digging up your lawn, garden, or driveway when you use a solar gate. Avoid Outages – When paired with a storage battery, your solar gate allows you to avoid being stuck behind your gate when the power goes out. We can help you choose the right storage battery for your needs. Lower Electric Costs – The costs of running an electric gate aren’t always huge, but solar power is essentially free. Tax Credits – When you install a solar power source for your gate, you can apply for a tax credit that could cover up to 30% of the purchase price. This can be a great way to save a little extra money on your gate. Is A Solar Gate Right for You? Does your fence get enough sun? Solar gates require about 5 hours of sun or more every day to operate efficiently. If your gate location gets less than that, solar might not be in your best interest. Can you handle the upkeep? Solar panels do require some additional maintenance, mostly in terms of making sure they are clean and positioned accurately. If you aren’t interested in taking care of a solar system, these gates might not be what you want. Do you use your gate often? Solar systems can easily supply enough power for light gate use (such as for a home), but they might have trouble keeping up with a heavily trafficked business. If you open and close your gate more than 10 times per day, solar systems might not be right for you. Solar fence gates can be a great way for you to get the gate you want where you want it. If you would like to learn more about our fence gates and other products we have available, contact Future Outdoors today. 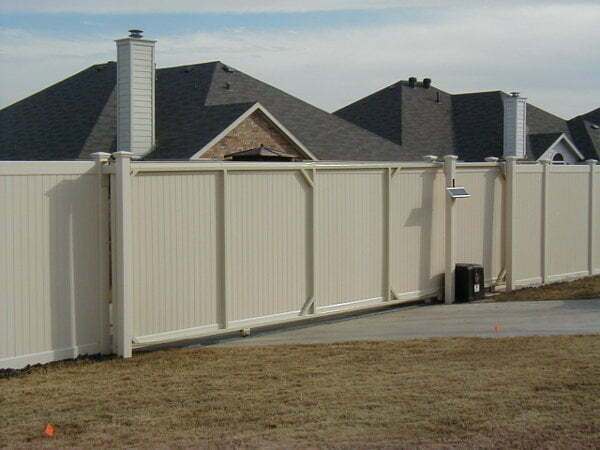 We’re the most experienced installers of vinyl fence, gates, and accessories in the Dallas metro. Call 972-576-1600 today to learn more or visit us on Facebook for more helpful posts and information.